The Hautes-Pyrenees local authorities have issued an avalanche warning for the coming weekend noting that the wind and cold temperatures will have formed snow slabs in the mountains. They've asked off piste skiers, snowshoers and ski tourers to be extra careful. 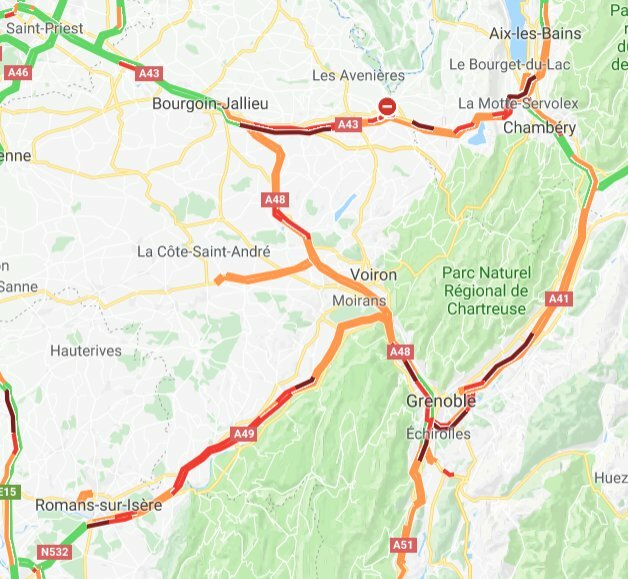 There has been a lot of snow transport in the French Alps at the start of the week under the influence of a strong, northerly wind. The previous anticyclonic conditions, coupled with a thin snow-pack, has created temperature gradients and led to the formation of weak facetted crystals in the snowpack, particularly on north faces. There have been reports of some small slab avalanches at higher altitudes, particularly close to summits and on shaded aspects. Nothing alarming but take care with the partial opening of ski areas this week. @davidof, Great new thread Reasonable amount here overnight and due to continue, not that heavily though, for several days. Must be looking quite good at les Deux Alps for the opening. Good conditions for the opening of the 7 Laux today but few skiers due to the cold (I'm tucked up in the warm doing some work today - but had a nice ski in the Chartreuse in cold, crisp winter conditions on Monday). Alpe d'Huez also looking nice on piste. Ditto Chamrousse. The local resorts got caught out the last couple of seasons so have been doing a lot better job at prepping the ski areas than previously. Chamrousse has bashed every snowfall in November. Great thread. Things are getting moving in the Pyrenees right now (including literally, it unfortunately seems). The Spanish resort of Baqueira-Beret, which is part of the same central range as Piau Engaly where that avalanche incident took place, will be opening more than 100km of piste this weekend, which gives an idea of how the early season is shaping up here. It's surprising to hear of an avalanche incident so soon, and it goes to show that one always has to be careful. Was out on a training day with Alain Duclos (one of France's national-level avalanche experts). We dug a bunch of pits at around 2500-3000m in Tignes. There's definitely a little depth-hoar around, one or two other weak layers too, but overall nothing too worrying. Certainly not on the scale of the past couple of seasons depth hoar o' doom (although it could happen yet!). 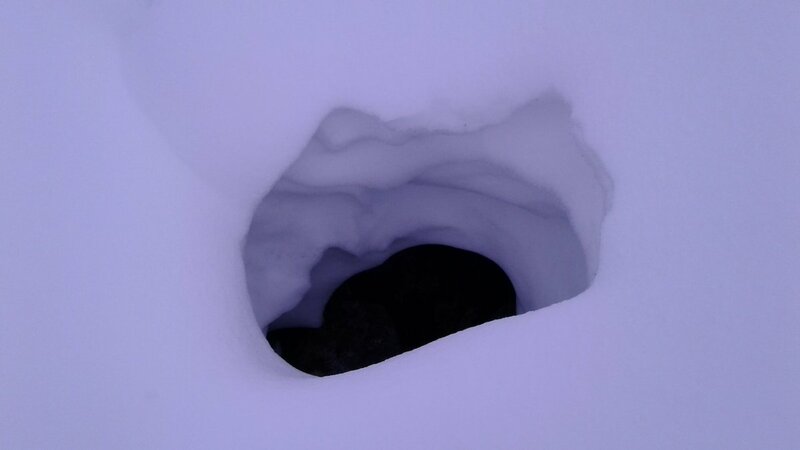 One of the dangers in limestone areas (Flaine is a good example of this) are crevasses that are poorly bridged - or in this case a hole has formed which leads down to the crack. A bit of a temperature gradient in the top layers, I think the thermometer went from -8 to -12C over 15cm, could form some facets near the top of the snowpack but there was nothing worrying at this spot today. No base below 1500/1600 meters. You need to target open slopes with few rocks. About 50cm of snow at 1850 meters formed during the 3 falls over November. It was even snowing lightly in Aix en Provence early this morning Friends have also posted of significant snowfall in Burgundy and very difficult driving conditions heading south last night. @davidof, Great report, thanks. Please keep them coming. Same in the Pyrenees, from last night until tomorrow night. Not in terms of how much, perhaps, but rather in terms of how low: to give an idea, the temperature won't rise much above 4 degrees at any point tomorrow in Toulouse which is at 150m altitude! In the mountains it is properly nippy at the moment, and there's snow on the ground over the entire Pyrenean range. The snowpack is generally pretty good over this way in Tirol, without any real problem layers. In steeper ridge line terrain there's often ~5cm of windslab on lee slopes that sloughs off quite readily (possibly sitting on facets formed last week in places), but so far as I've seen it's generally pretty easy to identify and manage. Thanks (everyone), not the same critical situation as last year then, but early days. What kind of depths have you got? I notice the "« Bridging index »" I've not come across a calculation for that before. Interesting. I guess the issue is the uniformity of the snowpack and 'hot spots'. It was down around Chambery/Grenoble for sure, but it was blue skies when I left the Vanoise this morning, and doesn’t look like there has been very much precip through the day, unlike Grenoble! Yes I was surprised, I guess the snow didn't penetrate too much inland. Hey Simon (and Ste Foy Steve) can't you help Alain Duclos with his translations? I'll do a bit but 6 videos is a lot. I've just finished a ten page document a French person translated and it was awful. If you are enjoying the partial openings in the Savoie this week-end bare in mind the warning of the avalanche forecaster who says that there is a risk of slabs up to 40cm deep on west facing slopes "watch out, it is the first day of risk for skiers this winter"
No danger of that down Sarf this weekend. 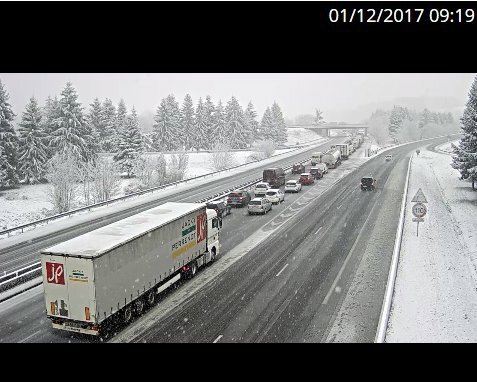 Friends yesterday were going over to Grenoble and turned back as traffic conditions were gridlock, by Bourg hardly any any snow. We drove up from the South to Champagny yesterday and it was white from Valence to just past Grenoble, I'd say a few inches of fresh snow most of the way. A lot less snow on the way to Albertville from Grenoble and just a light covering as we came into Champagny village at 1200 metres. The forecast for next weekend looks promising, heavy snow forecast from Thursday night. Hey Simon (and Ste Foy Steve) can't you help Alain Duclos with his translations? I'll do a bit but 6 videos is a lot. Yes am in touch with him about some other stuff anyway... Its a time thing though - I have a backlog already on the admin front...! Not the best time of year for you pros. I'm not sure there is ever a best time of year!! Meteo France has repeated the avalanche warnings for the Pyrenees and Corsica and has said that despite "limited snowfall" in the Alps the risk should not be underestimated. Just to note that around Grenoble we had heavy snowfall on Friday morning coupled with very strong winds that have persisted to today. You can hear the wind in this video from this pm - and even see some snow being blown around. A small slab had triggered on the lee of this slope. it is not particularly clear in this photo, bit of a corniche and debris field, possibly a slab that was triggered by skiers passing under the corniche (there were tracks). Very rocky on ridgelines and under on the north (windward) sides. 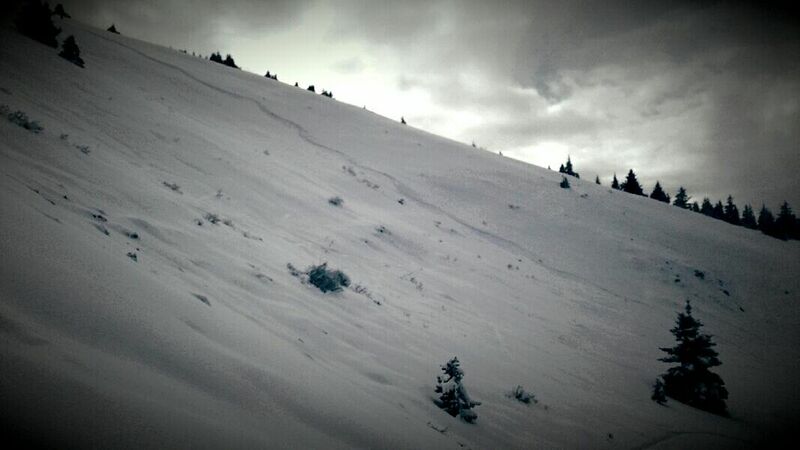 Skiing in Tirol today off piste was still light, but rocks not far below. Some evidence of Gleitschneelawien. Some just showing slippage, a small number of purges of whole snowpack. @onnem: A big retour d'est this w/e. I could see tracks leading to the bottom of the summit couloir in this photo, it is a dangerous place in these kind of conditions, but I don't know if the tracks were those of the victim. As we know some of the "locals" do not exactly think about security hence the big push by CAF down in this part of the world last season after the tragedies of the early 2015/2016 season down here. @Onnem, Limone cetainley scores big time, we had one great trip down there last season and depending on conditions plan is to be back down there just after the New Year depending on conditions. Heard that Queyras is good, but was is the definition of "good" at the moment? For sure there's good snow about in pockets but down here I'd like to see at least another 30-40 as each time I ventured away from the piste this weekend I was touching bases. The great majority of victims are experienced skiers or ski tourers, local to the mountains, including guides and ski instructors. This is the case for the Petit Som avalanche. One of the victims does a dozen ski tour per month, from the first snows of November to the last neve's of June. Year in, year out. He started skiing in 1965, ski touring in 1975. His companion, Olivier, was also experienced. A half dozen people, at least, were on the same route as the two victims. For the Dent de Crolles accident, the exact cause isn't 100% certain. The police talk of a possible "route finding error". There was low cloud but the victim skied it many times each winter, it was practically his "back garden". A very experienced skier. I don't know what conclusions one can draw from all that but it is clear that strong winds + fresh snow are a cocktail for slabs and that lee slopes should have been treated with some circumspection. 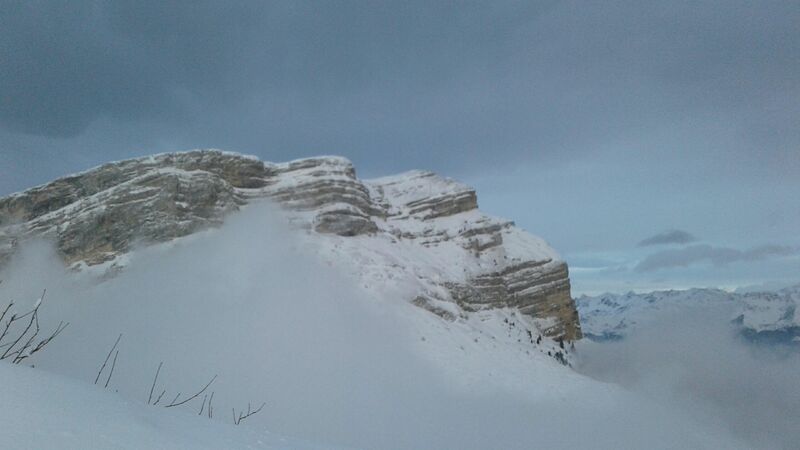 The Chartreuse is often considered to be "safe" when the avalanche risk is high elsewhere but the incidents I recall have all been following high winds. 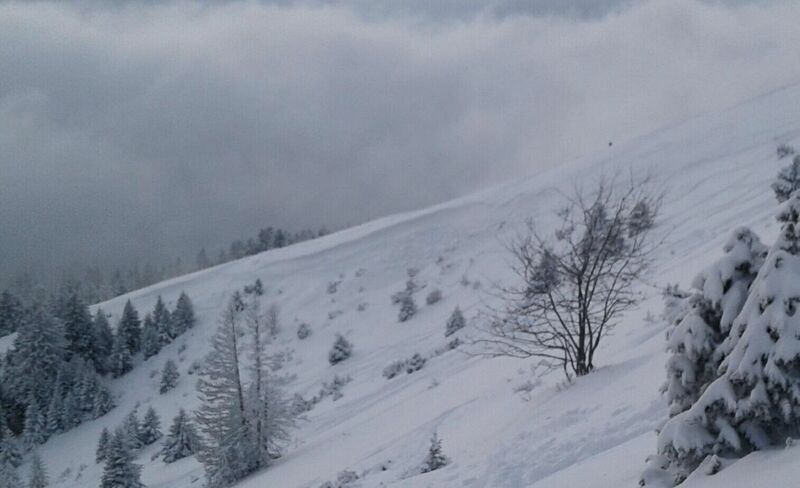 The Isere (French Northern Alps) prefecture has warned backcountry travellers to extreme caution in the mountains over the coming days, this follows the deaths of three ski tourers at the weekend. The great majority of victims are experienced skiers or ski tourers, local to the mountains, including guides and ski instructors. I skied with a guy from Flaine yesterday who told me around 35% of the avalanche incidents in that area involve very experienced people, in particular mountain rescue workers out in their free time. I don't know how true that is, but it makes sense that they're the sort most likely to be 'pushing it'. The Bergrettung here are pushing out a big campaign to always call in (140) if you set off an avalanche. You won't be in trouble; rather, you'll save the Bergrettung the expense of sending out a team to check that no-one is buried. It should be noted that mountain rescue efforts in Austria are NOT covered by the state, so anyone skiing or hiking in the Austrian Alps should make sure they are insured in the event anything happens. I've always used the Alpenverein in the past for this, but I've just found out that the Bergrettung have their own insurance policy too. €28/year = up to €25k rescue costs anywhere in the world, and the money goes to the Bergrettung to finance training etc. 70% of victims are locals in France, often with free time to chase conditions. I hiked up the Grand Som with a Grenobloise last summer. Looks as if the Petit Som is below and next to it. Hiking was hard enough RIP the 3 deceased. the avalanche occurs the slopes in the shadow under the col de Lechaud on the right bank (SW face of the petit som) when the wind blows from the north, or when there is a foehn, on the north side of the col de Lechaud. They are pretty regular occurrences in the sector. The col de la Ruchere seems to be safer. Must be something to do with the topography. A slab capable of burying you can form in half a day when the wind is right with no fresh snow. There have been a number of incidents. This looks to be a very informative thread and one I'll watch with interest throughout the season.